The West End (W1 postcode) is very fashionable with many tranquil squares and back streets. Harley Street is famed for its medical specialists, who started to move in around 1845 offering access to health care for almost every ailment to those who can afford to pay. There are a growing number of restaurants down towards Oxford Street. 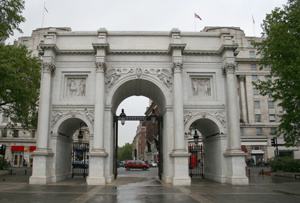 Marylebone High Street has several eateries, bars, cafes and delicatessens. Classical music can be heard at the Wigmore Hall. Shakespeare is performed during the summer at the Open Air Theatre in Regent's Park with its big, formal gardens and a lake. London Zoo, also in the Park, is a marvellous place for the kids. Look out for the Penguin Pool, the Elephant House and the Aviary. The West End with its cinemas, theatres and other attractions is a fine location for those who like to be in the heart of London. Celebrity residents include Madonna who has a Victorian townhouse in the vacinity. Marylebone station provides access to Tube and mainline rail services to Birmingham and the Midlands. Taxis are plentiful. Marble Arch and other Tube lines servicing the Hyde Park and West End area are the Bakerloo, Metropolitan, Jubilee, Circle, Hammersmith & City and the Central line.